For its St. Patrick's Day push, Jameson Irish Whiskey has created what it says are the first 3D video ads for Facebook and Instagram. 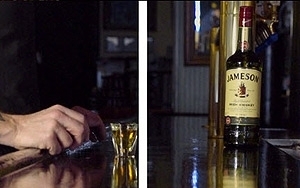 Jameson's 3D "Shoot the Feed" videos are being promoted on Instagram and in mobile newsfeeds nationally, as well as shared organically on the brand's social media channels and community pages. The "Long live the shot!" campaign is also employing Facebook's beta geo-fencing capabilities for hyper-targeting within New York City — a first for both Jameson and Facebook. The brand is sending photos to Facebook users who are in or near certain New York bars. The #ShotsEyeView images are photos of neighborhoods and bars that were taken, through the lens of a shot glass, by local residents. The campaign's concepts came out of a Facebook "Spark Session" among the platform's advertising pros, Jameson and its lead media agency, 360i, and creative partner Phear Creative, according to a 360i spokesperson. The goal: "brainstorm inventive ways to leverage the full power of the feed to target relevant creative at the national, local and hyper-local neighborhood level." On St. Patrick's Day eve, Jameson also live-streamed a concert from Dublin, featuring the bands We Cut Corners, Little Green Cars and Delorentos. In a Jameson-sponsored video on social media, We Cut Corners members offered a tour of their favorite hangouts in Dublin.